Understand how to maximize the effectiveness of shared information and how to do this with Easy Social Share Buttons for WordPress. 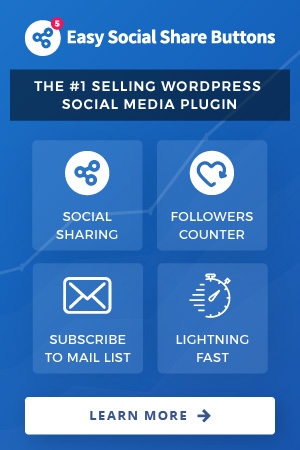 Our plugin automatically generates all required information for effective sharing over social networks and you have all required fields to customize that information. To personalize shared information to Facebook, LinkedIn, Google+ and many other networks you need to use Open Graph meta tags. Those tags are designed to communicate information about your website to Social Media sites when links to your site are shared. These tags allow you to craft custom titles, descriptions, and images to be used when your pages are shared. Easy Social Share Buttons for WordPress can generate those tags for you if the option inside settings is activated. Tags generated by Easy Social Share Buttons for WordPress are also integrated with WooCommerce too. If a WooCommerce product is detected we will also generate additional product tags like price, gallery, stock and etc. The tags generated by plugin are also fully compatible with Yoast SEO plugin – any optimization you set inside Yoast SEO plugin will also appear inside the tags generated by Easy Social Share Buttons for WordPress. Most of major social networks (like Facebook, Google, LinkedIn) get information for your site from the tags generated. That is why it is important the tags to be present on site and they need to have all required details. The tag requirement also make possible to have just one personalized message for one URL. To check are you generating social share optimization tags visit Social Sharing -> Sharing Optimization and check if the option is set to Yes. Deactivate WooCommerce Gallery Integration – that will stop generating all images from WooCommerce product gallery. It will show only the featured image. Default share image – we recommend to select such inside options. This image will automatically appear on posts/pages where no image was found. Easy Social Share Buttons for WordPress automatically generate social share optimization tags (when activated) with the default post information – title, description and image (featured post image). As mentioned above if you use Yoast SEO plugin the default details will also automatically include the optimizations you made. Customize Open Graph URL – Important! This field is needed only if you made a change in your URL structure and you need to customize og:url tag to preserve shares you have. Do not fill here anything unless you are completely sure you need it – not proper usage will lead to loose of your current social shares and comments. Twitter unlike other networks allows a deep customization. You can generate Twitter specific tags (called Twitter Card Data). The function of those is the same like the Open Graph tags. On the other site you can setup personalized Tweet on each post that will appear in the sharing too. The activation of those tags you can do from Social Sharing -> Sharing Optimization menu. Twitter Card Type – The card type determines the information that will appear. Summary is a text based tags, Summary with image also include as addition featured image. On each post or page where share buttons will appear you can customize the generated Tweet. Inside Easy Social Share Buttons for WordPress you have access to two different Pinterest working modes. The default mode is to Pin any image on your site. With this mode you cannot customize in detail the image that will appear inside the Pin. Pinterest will automatically read all require details from generated on site image titles (or alternative texts). You can also use a different mode where you can fully personalize the shared image and message. To change Pinterest mode you can visit Social Sharing -> Networks -> Additional Network Options and set to Yes the option to disable Pin of any found image. When the mode is changed on each post/page you can setup a personalized image for Pinterest.